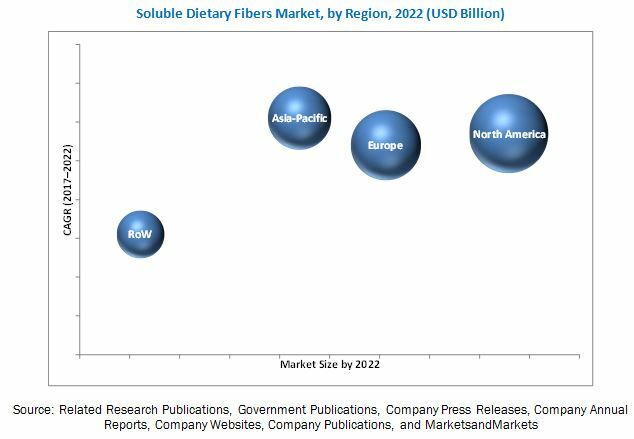 [130 Pages Report] The soluble dietary fibers market was valued at USD 1.52 billion in 2016. It is projected to grow at a CAGR of 13.4% from 2017, to reach USD 3.23 billion by 2022. The objectives of the study are to define, segment, and measure the size of the soluble dietary fibers market with respect to type, application, source, and region. This report includes estimations of the market size in terms of value (USD million). Both, top-down and bottom-up approaches have been used to estimate and validate the size of the global soluble dietary fibers market and to estimate the size of various other dependent submarkets in the overall market. Key players in the market have been identified through secondary research; some of the sources are press releases, annual reports, and financial journals, and paid databases such as Factiva and Bloomberg. All percentage shares, splits, and breakdowns have been determined using secondary sources and verified through primary sources. The figure below shows the breakdown of profiles of industry experts that participated in the primary discussions. The various contributors involved in the value chain of soluble dietary fibers market include manufacturers, suppliers, distributors, importers, and exporters. The key players in this market include Cargill (US), Ingredion Incorporated (US), Archer Daniels Midland Company (US), DowDuPont (US), Südzucker AG (Germany), Kerry Group plc (Ireland), Tate & Lyle PLC (UK), Frutarom Industries Ltd. (Israel), Royal Cosun U.A. (Netherlands), Nexira (France), Tereos (France), and Roquette Frères S.A. (France). Further breakdown of the Rest of the World soluble dietary fibers market, including countries in Africa, and the Middle East. Soluble dietary fibers are polysaccharides that function as prebiotic agents and regulate the balance of the gut microflora. These dietary fibers have hypocholesterolemic properties, which help in reducing and controlling the cholesterol and glucose levels in the blood. These fibers are predominantly found and extracted from fruits & vegetables, nuts, and cereals, such as oats. The global soluble dietary fibers market is projected to reach USD 3,231.0 million by 2022, at a CAGR of 13.4% from 2017. The growth of the soluble dietary fibers market is driven by an increasing number of health-conscious consumers, and ease of incorporation in production has increased its application base. Other key drivers include changing lifestyle, higher disposable income, and increasing demand for fiber supplements. 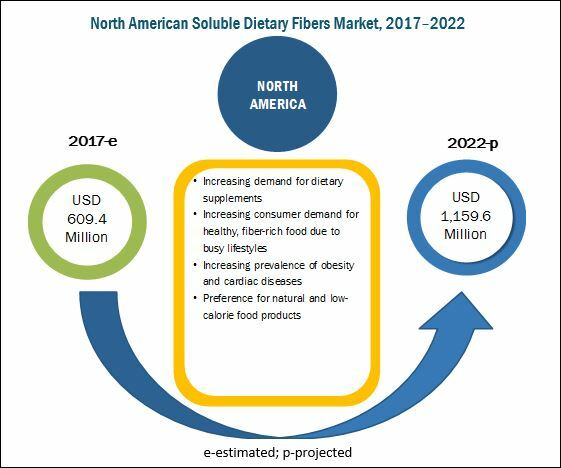 Substantial investments in the R&D activities, laboratories, research equipment, and hiring trained professionals have inhibited the growth of the soluble dietary fibers market. Key companies, such as Cargill (U.S.), E.I. du Pont de Nemours and Company (U.S.), Ingredion Incorporation (U.S.), and Royal Cosun U.A. (Netherlands) are focusing on building a strong R&D base to gain a competitive advantage, which is difficult for the small players and new entrants. It is observed that, in 2016, some of the leading food & beverage manufacturers invested 1%–3% of their revenue in R&D activities. For instance, Cargill has set up Cargill ONE innovation center in China, which focuses on producing innovative products to cater to the changing demands of Chinese customers in December 2016. Also, DuPont Nutrition & Health expanded its R&D facilities by setting up an innovation application center in India in March 2015. Price, quality, convenience, year-round availability, high shelf life, variety, nutritional concerns, safety, and hygiene are encouraging customers to spend on health & nutrition products. Consumers want time-saving and hassle-free products that are nutritious and healthy, owing to which there is a huge scope for value-added products. As the value-added products complement well with functional food, they witness significant demand among the younger and middle-aged population. Dietary fiber products offer these health-enriching and nutrition-dense properties, due to which the demand for these products continues to remain high. 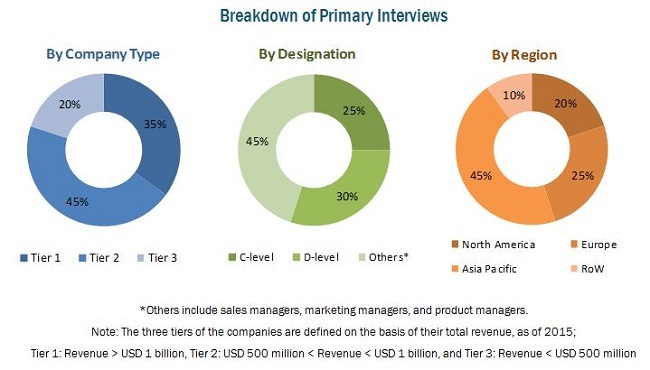 This market is expected to grow at a significant pace due to the increasing number of research studies about new applications, thereby helping manufacturers to develop new value-added products specific to the requirements of various sectors. Furthermore, the nutrition-dense properties of soluble dietary fibers and their ready availability make them ideal for food, feed, and dietary applications. Due to these factors, the value-added nutrition products have huge market potential for these fibers. Functional food can be described as food or ingredients that may provide health benefits and prevent diseases. Soluble dietary fibers are considered as functional foods due to the health benefits provided by them. Fiber ingredients are increasingly used to provide excellent dissolution and taste characteristics and they also blend easily with a variety of functional food & beverages. Commercially, health-promoting soluble fibers are being manufactured from a variety of sources. For instance, Frutarom Industries Ltd. (Israel) has developed galactomannan fiber from fenugreek seeds as a functional food product, which provides multiple benefits, such as balancing blood sugar levels, weight management, and prevention of indigestion. Consumption of functional food & beverages by health-conscious consumers is increasing the demand for soluble dietary fibers. 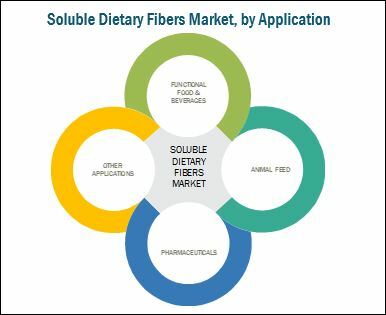 Soluble dietary fibers are increasingly being manufactured in the feed industry, owing to its health-promoting properties, such as regulation of intestinal immunity, lowering the number of pathogenic bacteria, and balancing of intestinal microflora. Commercially, highly soluble dietary fiber is available as feed in two forms, namely, powder and liquid. These products are a rich source of fiber and energy for animals and help in maintaining optimum health and performance. As the consumption of the feed-soluble fiber-enriched food to animals aids in the growth of useful bacteria in their large intestines, the demand for these fibers continues to remain high in the global market. Increasing awareness about health and nutrition-dense products has a driven the demand for soluble dietary fibers in the pharmaceuticals sector. The global market is witnessing the development of a wide range of applications of soluble dietary fibers on account of the strong research base to benefit the human health. Soluble dietary fibers are available in the form of supplements and nutraceuticals in the market. The main consumers of these supplements include the obese, cardiac, and diabetic patients. Other applications of soluble dietary fibers include bakery, confectionery, processed foods, and personal care products. Commercially, soluble fiber is increasingly incorporated in the bakery and processed foods, such as fiber-enriched bread and biscuits to enhance both, nutritional and functional benefits. Soluble fibers, when used in confectionery products, such as jellies and candies, provide the products with a stable structure and chewy texture. 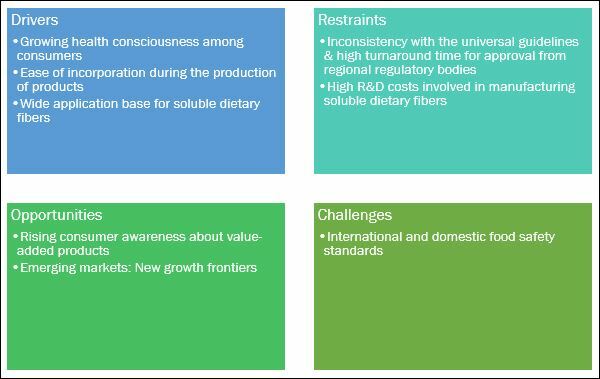 The soluble dietary fiber industry is going through the demand-supply gap; when will this scenario ease out? The market for soluble dietary fibers is projected to account for the highest growth rate in the next five years. With functional food & beverages gaining more traction in the global market, will the suppliers continue to explore new avenues for soluble dietary fibers? What could be the adjacencies? Most suppliers have adopted marketing strategies, such as expansions, as could be seen from the recent developments. Where will it take the industry in the mid to long-term? What will be the prominent revenue-generating pockets for the market in the next five years? The soluble dietary fibers market is projected to grow at a CAGR of 13.4% from 2017, to reach a projected value of USD 3.23 billion by 2022. The growth of this market can be attributed to the growth of convenience food sector, favorable functional properties of soluble dietary fibers, and the growth in usage and applications of soluble dietary fibers in the functional foods & beverages industry. Further, increase in R&D activities on various types of soluble dietary fibers such as inulin, beta glucan, and pectin has increased the overall product offering range as well. The soluble dietary fibers market is governed by different regulatory bodies, which vary regionally. Thus, the inconsistency on universal guidelines and high turnaround time for approval from regional regulatory bodies act as restraints for the market. The inulin segment, on the basis of type, accounted for the largest market share in 2016, due to its multiple health benefits. Inulin is extensively used as a food additive to enhance flavor and acts as a replacer of fats & sugar in various food applications such as bakery, frozen dairy desserts, and confectionery products. The fruits & vegetables segment, on the basis of source, accounted for the largest market share in 2016, owing to its higher soluble dietary fiber content in a wide variety of fruits & vegetables. Extensive sources for soluble dietary fiber, ranging from fruits & vegetables, cereal grains to seeds are available for human and animal consumption. Among them, fruits & vegetables dominated the soluble dietary fibers market. Soluble dietary fiber such as inulin and fructooligosaccharide (FOS) found in some vegetables helps in maintaining the function of the intestines. Fruits such as apples and pears have a high content of the soluble dietary fiber, pectin. Thus, due to the various health benefits of soluble dietary fiber drives the demand. The application of soluble dietary fibers is estimated to be the largest in the functional foods & beverages sector due to the growing application of soluble dietary fibers to obtain varied functional properties in food products such as confectioneries, beverages, and processed foods. North America accounted for the largest market share in 2016, due to the increase in consumer demand for healthy fibrous food. Asia-Pacific is projected to be the fastest-growing region from 2017 to 2022, due to its large untapped market, growing food sector, and low production costs. The food & beverage market in the Asia-Pacific region is currently undergoing a dramatic transformation in response to rapid urbanization, diet diversification, and the liberalization of foreign direct investment in the food sector. North America and Europe are estimated to be the dominant regions in the soluble dietary fibers market. The factors that influence the growth in these regions include high demand for functional food & beverage products, the presence of major players in these regions, and awareness about the benefits of using soluble dietary fibers. The market growth in developing countries is expected to be primarily driven by the changes in consumption patterns, public nutritional health & wellbeing measures, use of new sources for manufacturing soluble fiber, easy availability of raw materials, and product innovations. The market is dominated by key players such as include Cargill (US), Ingredion Incorporated (US), Archer Daniels Midland Company (US), DowDuPont (US), and Südzucker AG (Germany). Other players include Kerry Group plc (Ireland), Tate & Lyle PLC (UK), Frutarom Industries Ltd. (Israel), Royal Cosun U.A. (Netherlands), Nexira (France), Tereos (France), and Roquette Frères S.A. (France). The key players have adopted strategic developments such as new product launches, acquisitions, joint ventures, expansions, partnerships, and agreements in order to explore the market in new geographies.